October 24, 2016 – The University of Colorado Boulder’s QB-50 CubeSat has taken a major step forward. On Friday, after months of building and testing, the satellite left campus and headed to the von Karman Institute for Fluid Dynamics in the Netherlands for final work. The CubeSat will return to the United States for review and launch this winter. QB50 is a project led by a consortium of 15 international partners. The international effort will launch fifty CubeSats into low earth orbit. Forty-five of those CubeSats will form a constellation to investigate the Earth’s thermosphere, one of the layers rarely investigated. The remaining CubeSats will carry technology to be tested in orbit — among them, the re-entry CubeSat of the von Karman Institute, which will be equipped with a thermal shield to allow the CubeSat to reenter the Earth’s atmosphere. The data from the 50 CubeSats of the QB50 mission will be compiled in a common repository that will be used for coordinated, international scientific analysis. Funded by the National Science Foundation, CU Boulder’s QB50 contribution, known as Challenger, will carry a mass spectrometer to measure the constituents of Earth’s thermosphere, and their relative abundance. QB50 is another example of the first-class science that can be achieved by using relatively low-cost CubeSats. The lower thermosphere is largely unexplored because building a network of costly satellites to explore this region can’t be justified in view of the limited orbital lifetime. A network of CubeSats for in-situ measurements is the only realistic option. The QB50 CubeSats will be launched together into a ‘string-of-pearls’ configuration in a circular orbit at 320 km altitude, inclination 79 degrees. Due to atmospheric drag, the CubeSat orbits will decay and progressively lower, making it possible to explore lower layers of the thermosphere/ionosphere without the need for on-board propulsion. The mission lifetime of individual CubeSats is estimated to be about three months, but could be longer. The QB50 program has been in production since early 2014. CubeSats, with their relatively short design cycle and modest resource requirements, provide students with invaluable real-world experience. In 2006, CU Boulder’s Dr. Scott Palo and Dr. Xinlin Li developed a CubeSat graduate projects course designed to give students the opportunity to develop actual flight hardware. 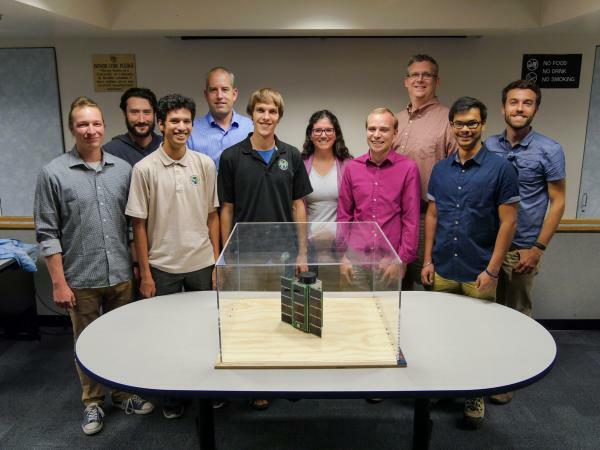 Students in the course have previously executed two CubeSat missions from proposal to launch. Professionals from the Laboratory for Atmospheric and Space Physics (LASP) and faculty in the CU Boulder Aerospace Engineering Sciences department serve as mentors for the students involved in the design and operation of the CubeSats.